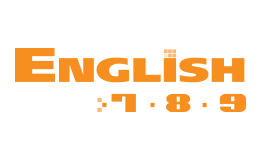 English is an innovative intermediate-level program for seventh, eighth, and ninth grades. This series was conceived with a creative enthusiasm for the exploration of literature and linguistics. Also, we introduce Mr. Handbook©, a curious stick figure that will accompany the students in the process of learning and developing the English language. English proposes a commitment to literature and reading, which serve as the center for the development and progress of reading comprehension, vocabulary, grammar, language, and oral and written communication skills. The exercises and assignments promote critical thinking, classroom discussion, group and individual work, text interpretation, public speaking, creative writing, and the desire to go beyond the text into the practical and technological world of the English language.